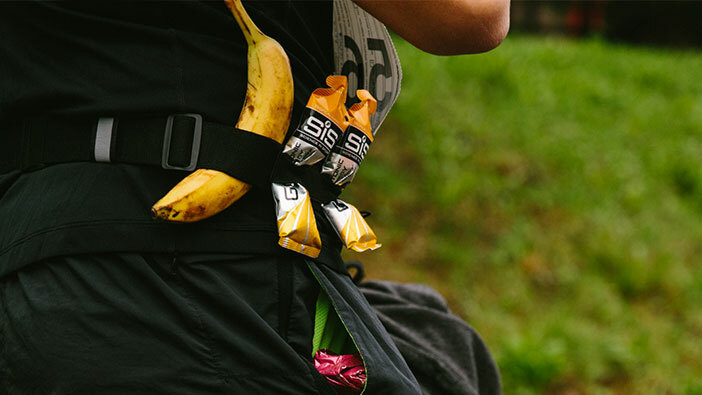 Runners know the importance of fuelling up for running, but what you eat and drink after a run is also important, in terms of maximizing your recovery. Remember the three 'r's' - rehydration, replenishment, repair - and you'll be raring to go again in no time. Here are some top post-run snacks. Yes, chocolate can be part of a healthy runner's diet! A study in the International Journal of Sport Nutrition and Exercise Metabolism found that chocolate-flavoured skimmed milk aided recovery at least as well as off-the-shelf recovery drinks when consumed after exercise. A salty high-carb but low-fat snack, such as pretzels or rice cakes, can help replace electrolytes (such as potassium and sodium, lost through sweat) as well as stimulating thirst to remind you to keep hydrating after your run is over. The ideal ratio of protein to carbohydrate in a recovery food is 1:3 - for example, 20g of protein to 60g carbohydrate. Readymade recovery bars fit the bill perfectly and are ideal if you are short of time to prepare a proper snack. But grab a piece of fruit too - processed bars don't provide any antioxidants, which help support your immune system. Yoghurt is low in fat, high in calcium and good for your gut. Team with pomegranate seeds, which a study from the University of Texas found could speed up muscle recovery as well as reducing post-exercise soreness, for a light, low-calorie snack. Beans are one of the few foods rich in both protein and carbohydrate while tomato sauce is a good source of the antioxidant lycopene. Pile on to wholegrain toast to boost carbohydrate and fibre intake. Simple and quick! Research from Northumbria University found that athletes performed better in subsequent bouts of exercise when they drank a milk-based drink after an initial workout session, compared to water or a sports drink. Banana boosts the carb content and provides potassium, which is lost through sweat. Whizz half a banana, a teaspoon of honey and 250ml of milk in a blender until smooth and you have the perfect mix of carbohydrate, protein and fluid. A pinch of cinnamon adds flavour. Sports nutritionists recommend taking on approximately 1g of carbohydrate for every kg of your body weight after a long or hard run to replenish the body's glycogen (carbohydrate stored in the muscles and liver) supply. Each slice of malt loaf provides 20g of carbohydrate and it's portable enough to go in your kit bag, desk drawer or glove compartment. Tart cherry juice is rich in the antioxidant anthocyanin, which has been shown to speed up recovery. In research from Northumbria University, 20 recreational marathon runners were given tart cherry juice or a placebo for five days before their race, on race day, and two days after. Those who received the cherry juice experienced less inflammation and their muscle function recovered more quickly. Other good sources of anthocyanin include blackberries, blackcurrants and blueberries. Tuna is packed with protein, while bread provides the carbohydrate (opt for healthy loaves such as wholemeal, rye or multigrain). Add water-rich salad such as cucumber or lettuce to boost fluid levels, too. Runners have long known of the performance-boosting benefits of caffeine, but research in 2008, published in the Journal of Applied Physiology, found that a post-workout coffee might also do wonders for recovery. In the study, muscles regained 66 per cent more glycogen when athletes consumed 8mg of caffeine per kg of body weight - the equivalent of a rather nerve-jangling 5-6 cups of coffee. A milky brew, such as latte, increases fluid and protein intake and provides electrolytes. In general health terms, it's best to stick to foods that are low on the glycaemic index (GI) such as wholemeal rice or pasta, pulses and wholegrain bread. But when it comes to recovery, high GI foods like white bread, bagels, pitta, rice or potatoes, can help replenish energy more quickly - ideal if you're feeling wiped out but need to get on with your day. Protein-rich peanut butter is high in fat but it's mostly the healthier unsaturated type - and peanuts are a great source of the antioxidant, vitamin E.
Ah, thought that might catch your eye! The bad news is, it has to be non-alcoholic beer to reap the full benefits of recovery. A study published in the journal Medicine & Science in Sports & Exercise found that runners training for the Munich marathon who drank 2-3 pints of non-alcoholic beer a day had a threefold lower rate of upper respiratory tract infections (such as sore throats and colds) and showed significantly less evidence of inflammation, as measured by various markers in their blood. Their immune systems were found to be overall in better health, too. Better save the real beer for after the finish line, then.